The last garden vegetables left to harvest include a few scarlet runner beans that I’ve had my eye on since their red flowers bloomed in August. I didn’t make time to paint them then, but didn’t want to miss them altogether. I sketched directly in ink and then added watercolor to the foreground layer. I went back in and painted an additional layer of light watercolor vines and beans to add more depth. The shadows are really important to making this work because they create the illusion of light and depth. Done in Stillman and Birn Zeta journal, 8.5 x 11. 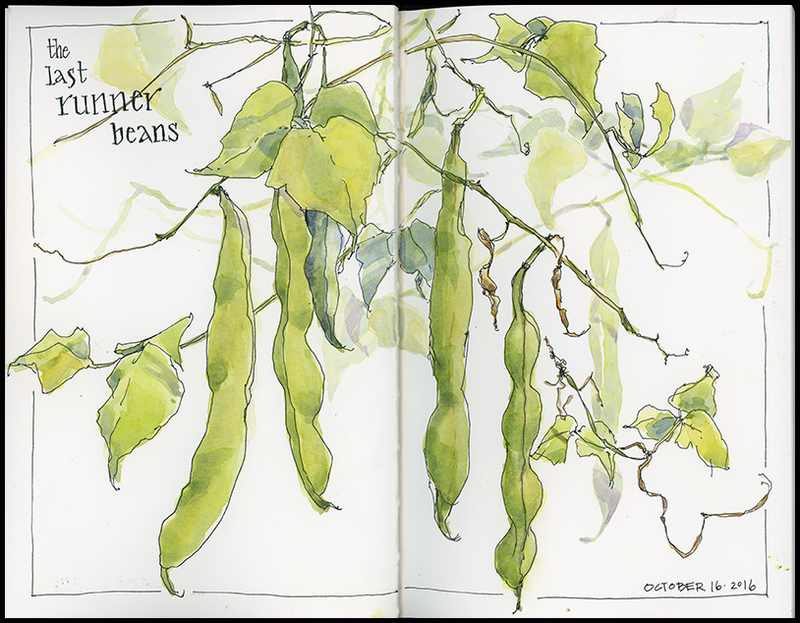 This entry was posted in Garden, Journal, Watercolor and tagged Autumn, beans, garden & flowers, watercolor sketch by Jean Mackay / Drawn In. Bookmark the permalink. You did an amazing job with the shadows and highlights-so realistic! Thanks Carol! This was one of those times when I just wasn’t satisfied with the initial ink drawing and painting– the page needed more, so I kept adding until it felt done. I’m glad I added those ghosted layers. beans. Just lovely. Am enjoying fields of prairie grasses here in Kansas! Enjoy the prairie…and get a sketch in for me! Thanks Jann– I like hearing that. I think that’s something I strive to find and depict in my art. I love this! The ghosted layers add so much interest. I was trying to sketch some sweet pea vines and couldn’t get happy with the clutter of linework. This approach makes so much more sense. Sweet peas are so lovely to paint– I think this technique would work well for them because they are so delicate. I really like this sketch–especially the way you added that lighter layer in the background–I think that Makes it very interesting to look at. Thanks Annie. That was fun to do. Lovely! Shadows here are really effective. The last bit from the harvest I have (besides storage things like squash and onions) were red and yellow cherry tomatoes. Yum! And question: I am seeing that particular type of sketchbook popping up everywhere on people’s posts. Anything special about them? Hi- I have tried all sorts of sketchbook brands and ultimately, you have to find what works best for you. But– I really like Stillman & Birn for several reasons: they are really well made; the paper holds up with watercolor; there are a number of sizes, papers and binding options and I love the hard bound book. If I’m going to invest my time doing artwork in journals, I want to do it in a high quality book that will last. At the same time, I don’t want the book to be so precious that I don’t feel comfortable carrying it in the field in all sorts of conditions. I’ve been using these sketchbooks for several years and have been very, very satisfied. Give one a try. Jean! Your work is ABSOLUTELY exquisite!! You have such a wonderful sense of design in addition to knowing intuitively what works!! Everything you create is simply stunning!! And, you are doing what I wish I had the time and energy to do- tho I certainly have the desire!! Wow!! Amazing!!! Looks like real! And the shadows, perfect!!!! This is so good.Not a fan of vegetables but of your writing,definitely yes. You should follow my blog posts for travel poetry. Thanks. There is a fascinating intersection between poetry and art. Will check out your site. Thank you.It is still in it’s novice stage. We all start there. Best to just keep writing, building, exploring. I like the cover image you chose. Yes,I will keep your advice in mind. Keep following for more content. Thanks…that’s a nice thought– and so true. Beautiful, can imagine a book completely illustrated in this style. Thanks– a possibility; though only one iron in that fire at the moment. Glad you stopped by and commented! Thanks Katie- So nice of you to comment! I appreciate it! Talent and dedication have combined to produce this beautiful work of art. Thanks for commenting. Yes, I just keep working at it– seeing, exploring, drawing, painting, sharing. Glad you stopped by. Amazing! Your hand is so skilled and precise to come up with this work of art from a seemingly ordinary subject, runner beans! O you, Artists, you are so extremely gifted! Your painting is an exquisite delight, very thought out! It looks like a photograph to me! The ordinary subjects are so often the best. Thanks for sharing your compliments! Amazing! Very detailed, and perfect colours – I could never have done anything even remotely near as good as that! Thanks much! This was a loose, fun piece– not much fuss, so I’m glad it came out well. Thanks Gail! Good luck with your blog! You manipulate the ink and watercolor well, great piece. Thanks Michael! I like the combination of ink with watercolor, especially for quick sketches. Thanks Ruby– appreciate your enthusiasm! Thanks Eric! Wishing you talent and perseverance, dedication and confidence. I like the two-page spread. Beans grow hither and yon, and you captured that! I really like to work across the spread. It’s less confining and more fun, and definitely suits a subject like this where you want the vines to trail. Good luck with your blog– I like the title. Thank you for your input about the title. I just changed it this week, so your feedback is very timely and welcomed! I tend to limit my palette to a few colors. I know how they mix together to get lots of variation and what effects I can get with them, so that helps keep me out of the mud. This piece has only about four colors mixed in different combinations. Glad you liked it! Oh crap. Just looked through some of your work on your blog. “I’m not worthy..I’m not worthy…” 🙂 wow it looks amazing. I’m going to have to sit down later and properly explore it. Just responded again but I think an error occurred. I’ve just looked through your blogs at some of your other work. Wow! Thanks Ned! Looks like you are dabbling in some interesting topics on your blog. Good to keep looking at the world in fresh ways! hi all right I loved your blog, I also have one and if you want to give a look I’ll be very grateful. Well…I guess you did like a few things here! I am looking at your blog, but I can’t read the text, so that makes it a little tough! What’s the gist? Great advice and great watercolors! Thanks– your blog looks fun. Wish some of the photos that are meant to be vertical weren’t posted horizontally…makes it kind of hard to see the style. But fun stuff, none-the-less. So nice of you to leave a comment and share your thoughts. I appreciate it! Thanks for checking in. I checked out your blog, but it’s not really my place or expertise to give you writing tips. The one bit of feedback that I would give is that I couldn’t really tell quite what the blog is about from the title and screenshot at the top, and you don’t explain the title in About. The “About” section is pretty brief and leaves me hanging, too– who is Florence? Why all this love and pain? Because first impressions count in blogging, you might want to take a look at that and see if you can make it more clear. Good luck! Better. Keep searching– keep being open to love…even through the pain. Be well. This is just so pleasing to the eyes!! Great work. You have very nice drawings. Wish I could do that free hand, lol. All I can do is color by numbers, lol. Keep up the good work, I especially like the string beans as they are one of my favorite veggies. Thanks– I appreciate you checking in to let me know what you thought. It’s always interesting to see what people connect with. I’ve always been a big fan of watercolor and your work is astounding. I like the subtle background. It adds depth to the picture without being distracting. Thanks so much for your enthusiasm and for following my blog. Hope you continue to like what you see here and share your thoughts.